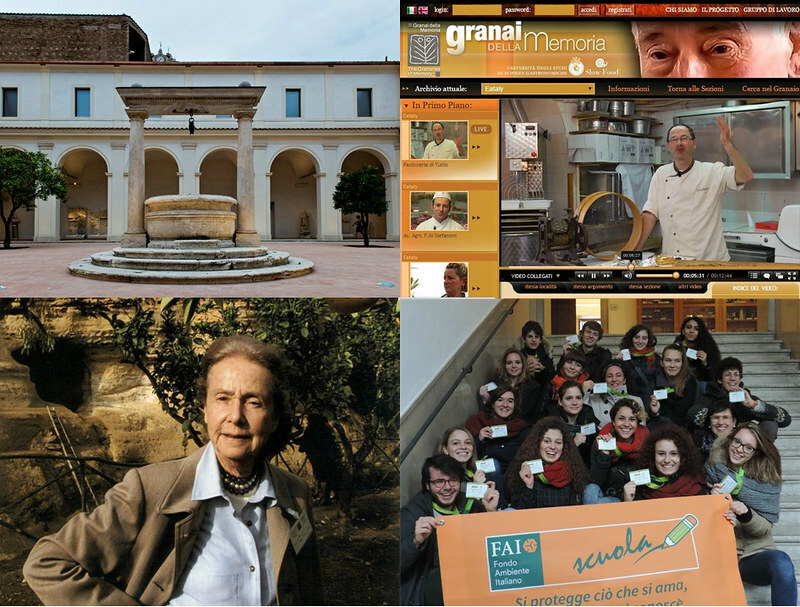 Rome, 8 November 2016 – Four exceptional Italian winners – the rehabilitation of the Diocletian Baths, the research project ‘Granaries of Memory’, Mrs Giulia Maria Crespi, who has devoted her life to the vigorous defence of Italy’s cultural heritage, and the education programme ‘Apprendisti Ciceroni’ run by FAI – Fondo Ambiente Italiano – will receive a 2016 EU Prize for Cultural Heritage / Europa Nostra Award, Europe’s highest honour in the field, during a high-profile event in Rome on 14 November. Dario Franceschini, Italian Minister of Cultural Heritage, Silvia Costa, Chair of the Committee on Culture and Education of the European Parliament, and Androulla Vassiliou, Vice-President of Europa Nostra and former European Commissioner for Culture, will pay tribute to these remarkable laureates from Italy. They will also take part in the debate ‘Cultural Heritage Counts for Europe’, spotlighting these and other powerful examples of heritage that generates countless economic, social, cultural and environmental benefits. The debate will start with the presentation of the Italian Edition of the ‘Cultural Heritage Counts for Europe’ Executive Summary, produced by Europa Nostra with the support of the Ministry of Cultural Heritage, Cultural Activities and Tourism (MiBACT). This exceptional event will be held on Monday 14 November (16:00-20:00) at the National Roman Museum of the Diocletian Baths (Aula X). The Report ‘Cultural Heritage Counts for Europe’ provides compelling evidence of the value of heritage and its positive impact on Europe’s economy, culture, society and environment. It was produced by Europa Nostra along with five European partners, and published in 2015. Since then, the Report has been widely recognised as a key study on the impact of cultural heritage, most recently in the European Commission’s proposal to organise a European Year of Cultural Heritage in 2018 (find out more in the Background section below). For detailed information about the Italian winners and the EU Prize for Cultural Heritage / Europa Nostra Award, which is supported by the Creative Europe programme of the European Union, refer to the Background section. The Diocletian Baths were built between 298 and 306 AD. In the 16th century, the extensive building was assigned to the Carthusian monks by Pope Pius IV and transformed into an impressive charter house with an adjoining church, following a design by Michelangelo. The small cloister of the charter house and the ancient open-air pool have been damaged in recent decades and suffer from structural problems, which led to the site being largely closed to the public for safety reasons. Preserving the many phases of the Baths was a crucial element of maintaining the site’s history. The construction of a new museum within the site posed a threat to the area’s original aspect and called for intelligent intervention. Because of this, the renovation works were completed using non-invasive innovative technologies, cleverly concealing them throughout the site. “This renovation project has reopened a vital part of Rome to the public and has reinterpreted the building to convey the significance of the Baths to visitors,” noted the Awards’ Jury. Professional researchers from the University of Gastronomic Sciences in Northern Italy conducted over 1,000 interviews in various communities to capture people’s memories of food and the regional cuisine. These interviews were recorded and are available to the public online in video format. While food holds the central focus of the project, the lifestyle surrounding its production and preparation clearly came to the fore. “Its thorough and wide basis of selection has the potential to be considered on a wider scale and should be observed in Europe as an example of good practice in conserving intangible heritage. This project is an occasion to give an Award to the memory of common people,” stated the Jury, who also admired the involvement of the community in this project. Although the interviews were carried out by professional researchers, the engagement of participants was broad and also fostered interest among younger generations. From a young age, Mrs Giulia Maria Crespi has had an active role in charitable activities and has devoted her life to the vigorous defence of Italy’s cultural heritage. Driven by this passion, Mrs Crespi co-founded FAI – Fondo Ambiente Italiano in 1975, a non-profit organisation modelled on the National Trust of England, Wales and Northern Ireland. Until 2010 she served tirelessly as the leader of the organisation. FAI has been responsible for an extensive amount of high-quality conservation, educational, and awareness-raising projects. The jury noted that “with her strong personality and leadership, Mrs Crespi has had a direct influence on policy- and decision-making with regard to cultural heritage in Italy. She has challenged the authorities time and again and mobilised private and public support to protect Italy’s landscape and heritage. Her many achievements serve as a legacy for present and future generations. With this Grand Prix, we pay tribute to an outstanding individual for her voluntary dedication to saving cultural heritage”. “Apprendisti Ciceroni” is a programme that instils an awareness of the value of heritage in Italy in young people. It has enjoyed a sustainable rate of growth since its creation in 1996. Students aged 14-19 are given the opportunity to study one or two heritage sites in their region and to present them as tour guides to the public during special events, organised by non-profit organisation FAI – Fondo Ambiente Italiano, as well as for private and public cultural institutions. Students engage in training activities that take place both in the classroom and outside in the field using a methodology developed by FAI. “FAI has established an impressive network of teachers, professionals and volunteers and has reached thousands of students, all while promoting cultural heritage in Italy. In targeting this audience of young students, FAI has managed to develop active citizenship among those who are less likely to visit cultural institutions with a well thought out programme of educational activities”, the Jury noted. The European Union Prize for Cultural Heritage / Europa Nostra Awardswas launched by the European Commission in 2002 and has been run by Europa Nostra ever since. It celebrates and promotes best practices related to heritage conservation, research, management, voluntarism, education and communication. In this way, it contributes to a stronger public recognition of cultural heritage as a strategic resource for Europe’s economy and society. The Prize is supported by the Creative Europe programme of the European Union. Since 2002, independent expert juries have selected 426 award-winning projects from 34 countries. Spain leads the list of winners (59 awards), followed by the United Kingdom (58 awards) and Italy (33 awards). In addition, a total of 95 Grand Prix, worth €10,000 each, have been presented to outstanding heritage initiatives, selected from among the award-winning projects. The project ‘Cultural Heritage Counts for Europe’ (CHCFE) aims to raise greater awareness about the many benefits of cultural heritage for Europe’s economy, society, culture and environment; it also presents strategic recommendations on how to tap into heritage’s full potential. This European cooperation research project was funded by the EU Culture programme and carried out from 2013 to 2015. The CHCFE project was coordinated by Europa Nostra through a Steering Group, composed of the following partners: ENCATC (The European Network on Cultural Management and Cultural Policy Education), Europa Nostra, Heritage Europe (The European Association of Historic Towns and Regions), The Heritage Alliance from England (UK), as well as The International Cultural Centre in Krakow (Poland), and The Raymond Lemaire International Centre for Conservation at the University of Leuven (Belgium). This two-year project culminated in the publication of the report ‘Cultural Heritage Counts for Europe’. The nearly 300-page Report, with its Executive Summary & Strategic Recommendations, demonstrates that heritage creates jobs, encourages investment and can improve social cohesion. An estimated 300,000 people work directly in the cultural heritage sector in the EU and as many as 7.8 million jobs indirectly. The key findings of the project were presented at a major conference held on 12 June 2015 in Oslo, during the European Heritage Congress organised by Europa Nostra. Europa Nostra has engaged in an active dissemination strategy of the project’s outcomes and has so far enabled the translation of the CHCFE Executive Summary & Strategic Recommendations into six languages (Dutch, German, Italian, Norwegian, Polish and Spanish). The German version will be launched on 10 November in Leipzig during the debate ‘Towards a European Year of Cultural Heritage 2018’, organised by Europa Nostra.